Got this recipe on food.yahoo.com. Been waiting a couple weeks to try it. Not bad. Because of all the big grains, most of them weren't super crunchy, but they were very flavorful. All we topped them with was peach preserves from the Clintonville Community Market. Made a bunch extra to freeze for weekday b'fasts. You've switched on my waffle craving. It's almost almost time for fresh strawberries to top them! 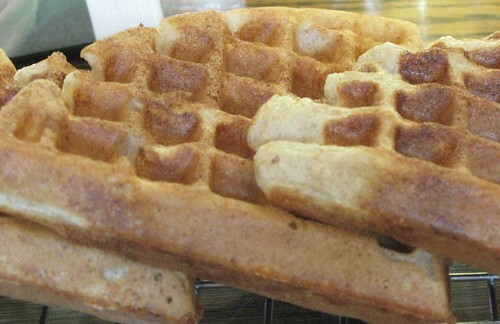 We have waffles several times a month on Sundays. Do them at the table. It's a great ritual, highly reccommend it. Upon thinking about it a couple days, I think I'd actually opt for these over our plain unbleached white-based version. These had better depth of flavor without the often off taste of whole wheat flours. The King Arthur's white whole wheat is pretty nice. And all fruit toppings are the best! My name is Shannon and I'm the editorial assistant at Foodbuzz.com. I am very impressed with the quality of your posts and to that end, I’d like to invite you to be a part of our newly launched Foodbuzz Featured Publisher program. I would love to send you more details about the program, so if you are interested, please email me at Shannon@foodbuzz.com.